Al Plastino was the last living Golden Age Superman artist and while he'll always be inextricably linked to the character, he did so much more over his career, drawing daily strips, both ghosting and taking over for another cartoonist, advertising work and of course he was the co-creator of Supergirl and the Legion of Super-Heroes. Al became a friend, and it never ceased to be a thrill when he'd give me a call just to chat. It all began with this interview. Al Plastino: Did you see that article before I sent it to you? Bryan Stroud: I never had and I wanted to start off by saying thank you. I learned quite a bit from the information you so kindly sent to me. Plastino: It's been so long ago. I did "Supergirl" and I also did the "Legion of Super-Heroes". It was [edited] by Mort Weisinger. I believe he thought up the idea to have this group of young people band together. As far as it goes, I did the drawing. I'd pretty much forgotten all about it. Plastino: I guess so. And what I can remember is that I designed the costumes. And then I did the Supergirl. What else can I tell you? Stroud: You know one of the things that surprised me when you sent me the information; I didn't realize you'd ever done anything on Batman. Now was that the daily strip? Plastino: Oh, yes. Oh, I did a lot of Batman. I did it for 8 years for the newspaper with [Whitney] Ellsworth. Stroud: Okay, now was that before or after Joe Giella? Plastino: Gee, I think it was after. I think I was the last guy to do it. Stroud: Oh, so you actually got to sign it then. Plastino: Oh, yeah. Yeah, Ellsworth and Plastino are on all the proofs. Stroud: Ah, now that was a big change. Plastino: Bob Kane was on there, too, but he didn't do a damn thing. Stroud: Yeah, that's one of the things Joe Giella was telling me was that while he was doing the strip he always had to sign it "Bob Kane." Plastino: Yeah, well I didn't. The letterer put Bob Kane on it, on the first panel by the title and then the third or fourth panel was Plastino and Ellsworth. Stroud: Okay, yeah. He'd told me his successor was able to put his own name on there, but he didn't name you, so I didn't realize that you had taken over. Plastino: Yeah, it was me. Plastino: I did so many things. And commercial art, I did a lot of covers, love story covers. I could keep you here all day talking about the stuff I did. Stroud: Oh, I don't mind at all, sir. Now, Mr. Plastino, I notice that you're one of the very few; I can think of only maybe one or two, like Joe Kubert and Russ Heath who actually inked their own work consistently. Plastino: I did my own work. One name was on it: Al Plastino. Stroud: Was that by choice? Plastino: I demanded it. I said, "I'm not going to New York to have some guy ink and then I have to wait for it." No, no, no. That was the understanding that made me take the strip in the first place. If I can't handle it alone, I don't want it. I saw the rat race that was going on years ago when I was a young man and I worked for Chesler. Harry Chesler. Stroud: Yeah, a lot of people got their start with his shop. I think Joe Kubert did, too. Plastino: I wouldn't doubt it. And I saw what happened and I said, "Oh, geez, this is crazy, I'm not gonna do this." We had everybody in the studio. I still inked my own stuff, but we weren't allowed to do the lettering. Stroud: So you worked in the bullpen, then? Plastino: For awhile, yeah. I did everything. You name it, I did it. Then I got away from it and went into commercial art. Stroud: That paid better, didn't it? Plastino: Well, that was a rat race. I was with Jack Sparling, who was a cartoonist. Plastino: You remember his name? Stroud: I do. In fact, I think he did some work on Secret Six and some other stuff. I've seen his work. He's very good. Plastino: Yeah, and he did a strip for the PM newspaper called "Claire Voyant." And he was fast, I mean really fast. Plastino: Much faster than anybody. He wrote it, drew it and inked it. He did six dailies in one day. Plastino: Because the fella that delivered it to the newspaper lost it. He was fast. Stroud: Oh, that's amazing. How long did it usually take you to do a completed page? Plastino: Me? Oh, I averaged about 2 pages a day. Not truly completed, but I had to pencil, too. That was my schedule. And I always had two accounts. When I was doing Superman I was doing Batman. I was doing Superman AND Batman. I had maybe two weeks to do a story, so it didn't interfere too much, but of course with Batman there were six dailies and a Sunday. Plastino: I was working like a dog. My kids were little. Anyway, I got pretty fast watching Jack. He was a great help to me. We had a studio on 40th Street and Lexington Avenue. A third-floor walk-up. (chuckle) And another fella worked there. Daryl Walling did a strip for Herald Tribune called Skeates. He only did the Sunday page. So the three of us had a studio. We shared it. So I learned a lot from Jack. Stroud: A lot of short-cuts and stuff? Plastino: Well, the kind of work. Plastino: No. I never copied his style. Stroud: I guess what I meant were techniques. Plastino: Well, when you're around people that work fast, it gets into your blood. It's like, "I'm not working hard enough, and I'm not doing it fast enough." Stroud: Okay, it kind of sets the bar for you. Plastino: I think so. And during World War II I worked for the Pentagon. I invented a plane, believe it or not. I know it sounds crazy. I'm an avid builder of model airplanes and I always loved aviation and I got an idea for a plane. It looks like the space shuttle of today. It was 1941 when the jets weren't around. No jets. Anyway, maybe I'll send you a picture of it some time. Stroud: I wish you would. I'd love to see it. Plastino: Anyway, so they got me at the Pentagon and they didn't know what the hell to do with me, so I started drawing posters for the building. I'm drawing posters and then an Army General spotted me downstairs and says, "What the hell is this guy doing here? Get him upstairs. We need him upstairs." So I was assigned to the art department in the Pentagon, the A.G.O. department and I learned a lot there, too. Man, I learned a lot. Stroud: I'll be that was a wonderful training ground. Plastino: We had the best art directors you can name. And from there, they decided to place me in New York with Steinberg [Studios] to do the art work there because he was doing most of the art work. So I worked with Steinberg when he approached me, and said, "Al, they're looking for a guy to do Superman." I said, "Hell, no." He said, "They're paying $55 a page." I say, "What?" Anyway I did a sample and I went to see Jack Schiff and we talked and he says, "Okay, we'll give you $35 a page." I say, "Good-bye." "What's the matter?" I say, "Oh, no, no, no. Wayne Boring is getting $55 a page." "But, he's been here 10 years." So we settled for $50. Plastino: So I remained at $50.00. And I said, "Okay, great. I'll do it." Stroud: Good negotiating on your part. Plastino: Well, you see, when you have other income, you can do that. I was interviewed in an article where the headline is, "He's not my boss, he's my editor." And from there I explained why I was the way I was. I always had something else on the side. If you don't have something; and in my business, the comic business, they'll step all over you. So I just said, "No way! No way, good-bye." And I was able to do that because I had other work and that's how that came about. And I did that most of my life anyway, when I had an account like when Mikkelsen said about Ferd'nand when he was retiring, he was giving me $100 a week for just finishing up little things. Oh, another guy I worked for was Ray Van Buren on Abbie and Slats. I worked with him and I used to finish up his work and he gave me $100 a week. I was getting $100 all different places. (chuckle.) He would write on the original, "Al, finish up this; Al do this; Al put that in," and that was it. I always had something going. I never was satisfied with one thing. And I was able to draw different characters. That's the thing that amazed me. Just by looking at it I was able to copy it. They're all different styles, you know. Stroud: I was looking through some of your old work the other night and I saw the most beautiful rendition of the front of maybe a '58 Chrysler and I thought, "Man, that looks like a photograph." Plastino: Was that a Batman strip? I used the Mercedes, was it Mercedes? I forget now, but that was the only time I'll use photographs for a material thing like that. Stroud: I've got an artist friend of mine and he had a question he wanted me to ask and it says, "Ask him how tight his pencils were…"
Stroud: He says, "His work always looked like they were drawn with a brush over very, very simple roughs." Plastino: Right, right. That's what I did. I did that purposely because they asked me from time to time to do pencil drawings and I said, "Look, if I'm going to pencil tight, I might as well ink it." I mean, come on. So I always used a No. 3 Winsor-Newton brush, come to a fine point, and to this day I don't know how the hell I did it. My eyes are not that great any more. Stroud: That took some skill. Plastino: That's when you're young. You don't need glasses. I started reading glasses. I was doing Topps bubble gum cards. I did the Tarzan series and they were 3" x 4" and you'd have 60 on a page. So when I was ready to ink them I was backing up my head and I said, "What the hell's going on?" Then I realized I needed reading glasses. I did that for awhile for Topps bubble gum. I did that guy with all the animals. Dr. Doolittle from the movie strips. I did so many things. God, when I think about it, I wonder how the hell did I do it. I never turned anything down. Stroud: A very full career. Well, when you're supporting a family, you do what you've gotta do. Stroud: You're a young man. Plastino: Well, people think I'm young. I think that way, anyway. Stroud: That's excellent. Now, I'm told there was kind of a house style at the time. Did you have to kind of imitate Boring's style? Stroud: Yes, and I'm glad you said that because, you know, I don't want to criticize anyone, but when I look at Wayne's work, he doesn't seem capable of drawing a smile. Everybody looks like they're angry. Plastino: Well, that's the same with Neal Adams. Every time you look at his stuff a guy's got his mouth open yelling. He's a great artist, don't get me wrong. Plastino: He's a great artist. I remember him from Superman. Stroud: Yeah, and he did some wonderful work. It sounds to me like you two have one thing in common, too. He told me that he was able to tame the wild beast that was Weisinger and Kanigher. Plastino: Oh, yeah, oh, God, Weisinger was a mess. Murray Boltinoff, I also disliked. That's how I got into drawing Batman for Ellsworth. Plastino: I don't know if I should tell you this. But anyway, I got into an argument with Murray Boltinoff. They wanted me to work with him drawing Superboy and I couldn't stand the man. They got this attitude that they think who the hell they are. Later, when I was interviewed for an article, I said, "You're not my boss, you're my editor." So I never took no…baloney. I have to watch my language; my wife doesn't like it. Plastino: So when Ellsworth came in, Ellsworth saved his life. I swear, I was really angry and I said, "I wouldn't work with you." And he heard me, he said, "Look, Al, what's the matter?" I said, "Blah, blah, blah." He said, "Never mind. You work with me on Batman. You want to do Batman?" I said, "Yeah, rather than do work with this…banana head." Now Weisinger, I got along with him because I straightened him out a long time ago." Stroud: That seems to be what it took with him. Plastino: Because when [Joe] Shuster was in, when the poor bums that created Superman, was in his office one time and doing some writing for him, and he talked to them like they were dirt. So when they left, I just said, "Mort, if that was me, and you spoke to me the way you spoke to [Joe] Shuster and [Jerry] Siegel," I don't know who wrote it, I think Siegel wrote it and Shuster drew it, I'm not sure. He worked for a post office! "How the hell do you get the nerve to talk to him that way? Who the hell do you think you are?" Oh, I wasn't afraid. My wife used to yell at me. "Don't talk to them that way." I said, "What are you worried about him for? I'm not worried about him." So anyway, I laced into him. I said, "If it was me, I would have not only punched you in the jaw," and I'm not a big man, but when I get angry, I don't care how big the guy is, I get angry. Anyway, we got along fine after that. Stroud: That does seem to be what it takes. Plastino: Neal Adams has a lot of talent. He's a terrific artist, don't get me wrong, but the thing that upset me with his work was that if you look at it, you get nervous, because there's always somebody yelling, running, jumping. In fact I just saw [Paul] Levitz this past summer. I went to see him and he showed me around. You can't believe the place they have now and I was talking to him about it and he says, "You know, Al, I have to agree with you." I said, "The new stuff that comes out now, you've got a letterer, you've got a penciller, you've got an inker, you've got a background man, you've got a colorist. There's five or six names on this thing." Now everybody's trying to outdo the other guy. (chuckle.) The background man tries to put in…I mean, it gets confusing. Cars, buildings, because that's all he's worried about is the background. The other guy's worried about the figures. I mean, come on. Back then it was simple. We told the story, and everybody could understand it. Not the best artwork in the world, but it told the story. It was clean cut. And he agreed with me. I don't hold back any opinions. Do you remember when we did the wedding story where Superman got married? Plastino: I had two pages on that, and everybody had two pages. So my villain was a young boy. It called for a young thug, maybe fifteen, sixteen or seventeen [years old] in my series. The next two pages the guy aged about 20 years. (chuckle.) So when I went in to see Levitz, I said, "Paul, who the hell's the editor that checked this out before it was printed?" There was about five guys in the room. So the one guy was quiet. He said, "It was me." I said, "How the hell…" "It was one of those things, Al." "How the hell could you mistake my character, because I did the pages first, and he was supposed to pick up on mine?" The guy became an old guy. I don't know if anybody caught it when they see the story. The poor guy was standing in the doorway. I said, "You're the guy who did this?" I said, "How the hell did you do that?" "Well, it happens." Stroud: (Laughter.) Too many cooks. Plastino: Well, you know, even at United Features, five guys have to check a copy and there's still mistakes. A guy overlooks a word, a word looks like something it's supposed to be. So, it's gonna happen. But it was funny. It was a funny day. Stroud: When you were doing the Superman titles, Carmine was telling me that typically they'd do a cover first and then build the story around it. Plastino: No, no, no. The cover came later. I did 48 covers. I've got a book with all my covers. Sometimes they'd copy from the splash, the opening page, but the covers; where the hell did they get that idea? How could you do a cover from a story that's not even done yet? Stroud: No, not for Superman. Plastino: Okay. Maybe they worked different. Stroud: I didn't know if they did that for the Superman titles, because as I was looking through I got to thinking about one of the Action comics that you illustrated with the Parasite, do you recall that one? Stroud: Yeah, a purple guy that absorbed the powers from Superman. Anyway, Curt Swan had done the cover, but you had done the interiors, so I wondered which one came first. Plastino: No, the cover never came first. Stroud: So in essence you helped create the Parasite then. Plastino: Probably. When Mort would call me in to do a cover for a story that I'd already done, like Luthor… I did so many covers, I mean, my God. The imp and blah, blah, blah, blah, blah, you name it. It doesn't make sense. Unless you worked with the editor and the artist who was doing the story, like Carmine, who's a hell of a nice guy, by the way. I got along great with him. He's a good guy. But I'm positive we didn't do the cover first. Why would you do a cover and then do a story? They got the best part of the artwork. 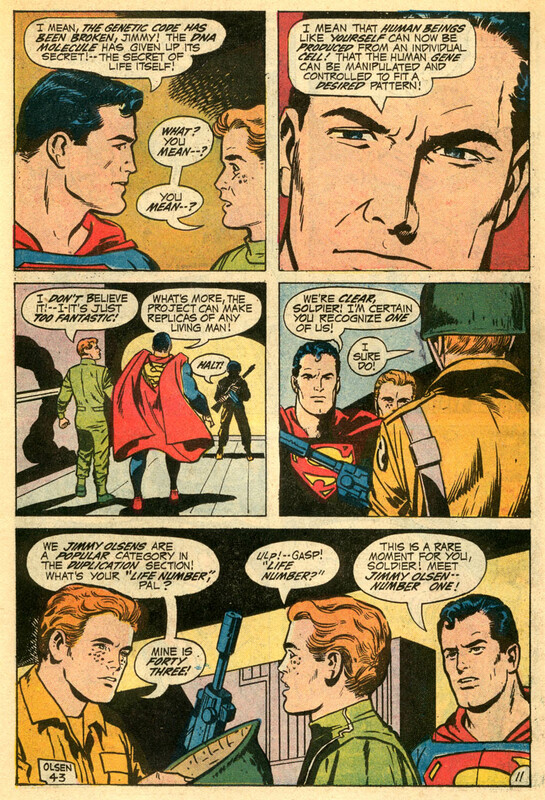 See, what happened later on, I guess Curt Swan, poor guy, I didn't mean to say that, but I felt sorry for him. Plastino: Well, all he did was pencil. Plastino: You're an artist, but just do pencils and you have to make them exact, because anybody could ink them. Anybody could ink Curt's stuff. Anybody. And I think Murphy Anderson used to ink most of his stuff. And Murphy is a great inker. Stroud: I know he did a lot of it. Plastino: Yeah, because you just follow his lines. You just give it a little snap with the brush, but you're still following the man's lines. He puts the blacks in, he puts everything in. I think I did only one story with Reuben Moreira, I think it was Ruby who penciled and it drove me crazy because I couldn't conceive his heads. So I insisted on doing Superman, I said, "You don't do Superman, you do all the other characters." You can see the difference. It's a story I did a long time ago. Stroud: That reminds me there's another legend I was going to ask you about. When Jack Kirby took over Superman they had you re-do the heads? Is that correct? Plastino: Yes, yes. That's a pain in the neck. I had to paste in the heads. Stroud: Okay, so you just pasted them right over the top. Plastino: Yeah, well you just put it on very thin paper. You draw it and you put rubber cement and cut it as close as you can and put some outside lines to lead into it so it looks kosher, you know. It looks like it hasn't been touched up. Which is a job in itself. Stroud: Oh, I bet. Did that bother Jack at all? Plastino: I don't think so. He didn't say anything to me. Stroud: Okay. You hear different stories and you're never sure what the truth is. Plastino: I know I did paste those. Mort would call me in and Mort would talk like…I'd better not imitate him, forget it. Plastino: One good thing I have to say about the man. He had these crazy ideas, which I thought were crazy at the time, like Superdog and Supercat and all this junk, but it sold books! Stroud: So those were his ideas. Plastino: Yeah, Supercat? What the hell are you guys talking about? I did Superdog in many stories. Stroud: It was a running character there for quite some time. Plastino: Yeah. The imp. I had changed him to my way. I didn't care for what he looked like and they mentioned that in an article once. Stroud: Yeah, that you had redesigned the costume. Plastino: Yeah, everything. The guy's hands. Everything. So long ago, my God. Stroud: Have you seen the new paperback reprints they're doing of the old Silver Age stuff? Plastino: Yeah, I get them. They mail me three or four or five copies at a time. One good thing came out of all this: Royalty checks. I get great royalty checks. (chuckle.) Every time they reprint something I get…last year I made $10,000 on royalty, because I have so many stories. In one book there's twelve stories, the soft cover and another one had fourteen of my stories and covers. Foreign covers aren't so good. I was interviewed by a Canadian broadcaster a couple of weeks ago, so it gets out and gets to Canada. Now Batman, I don't get a damn thing for that. I didn't do too many comic books I just did it for the syndicate and the syndicate went broke. So I don't get anything from there, just Superman and Superboy. Bryan Stroud has been an avid fan of DC's Silver and Bronze Ages and is the co-author of "Nick Cardy: Wit-Lash." He's managed to conduct well over 100 interviews to date and hopes he's not finished yet. A happily married man of 28 years, he and his lovely bride live in the high desert of Southern Colorado.